A dog comedy show, wine and magic, chocolate festival, decadent dinners and more fun events are happening this month in Northern Michigan. Grab your calendar! Central United Methodist Church presents National Geographic Archeologist in Residence, Dr. Fredrik Heibert, sharing his personal account of The Church of the Holy Sepulchre Experience. Dr. Heibert will share photos of the expedition, including the unearthing of The Tomb of Christ, and give first-hand testimony to the historic and religious significance of this discovery. At age 23, author and journalist Drew Philp graduated from the University of Michigan and decided he could help fix Detroit by rebuilding an abandoned house in the inner city. His fascinating journey of self-discovery led to his debut book, A $500 House in Detroit—a great read that delves into issues facing cities today. Live music, cash bar, and Morsels sweet treats. Stage conversation and Q&A with the author. Northwestern Michigan Orchid Society’s Jan Rygwelski and Jim Scrivener will talk about the art of growing and caring for orchids. Jan and Jim will share with us the basic needs of orchids—water, light, temperature, humidity, and air movement. Information on potting and potting media, pests, and pest management will be covered. Questions will be welcomed! There is no fee for this class, though you do need to reserve your spot. Free-will donations are greatly appreciated and will support The Botanic Garden at Historic Barns Park. It may be the funniest and most fun live show you’ve ever seen. Bring the whole family to witness the antics of these highly trained professional canines. They’ve appeared at NFL halftime shows and stolen the day! Every dog is a rescue pup, and they invite you to come early and meet local dogs at a pre-show adoption event! Tickets: adults are $25, seniors or groups of 10 or more are $23, children are $13. This tragicomic mystery shows us the world through the eyes of an 80-year-old man as he loses control of his mind. The Father is an astonishingly unguarded play about the cruelties of love, the limits of patience, and the way parent-child relationships reverse as the years pass. Tickets are $17 per person. Go wine tasting. Plan your wedding! Tour wineries, meet vendors and create your dream wedding. 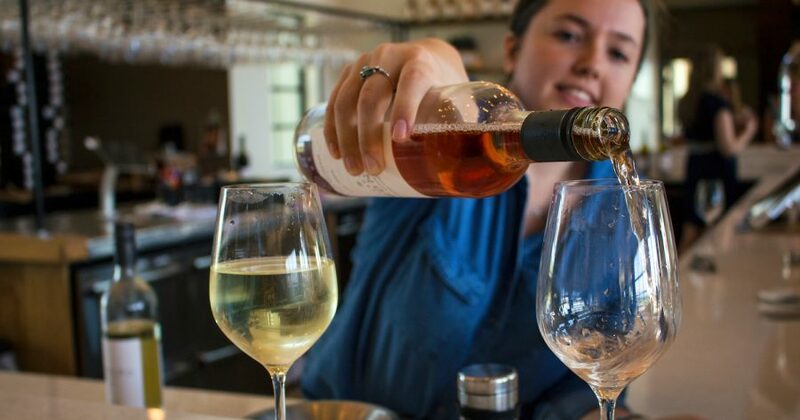 Brides, grooms, friends, and families can visit eight wineries on Leelanau and Old Mission peninsulas, and everyone gets a wine taste at each stop! Buy four tickets or more and get $5 off each one. This event pairs Leelanau Peninsula Wines with nationally touring comedians. Michael Palascak has appeared on Comedy Central, The Late Show with David Letterman, The Tonight Show with Jay Leno, Conan, The Late Late Show with Craig Ferguson and was a finalist in NBC’s Last Comic Standing. Pulitzer Prize winner Eileen McNamara reveals one of Camelot’s untold stories with a book about Eunice Kennedy and her lifelong championship for the disabled. Eunice, angered by the treatment of her sister Rosemary, was a cigar-smoking, hard-charging advocate for those with special needs and founded the Special Olympics. Live music, cash bar, and Morsels sweet treats. Stage conversation and Q&A with the author. This “super Yooper comedy” was written by Jeff Daniels. Concessions will be sold at the event. Tickets cost $18. Downtown Traverse City will again be hosting the Annual Celebration for Young Children. Join hundreds of little ones and their families strolling through downtown and celebrating by taking part in activities throughout the area. Events will take place at Horizon Books and many other locations downtown. Admission is free! With 16 Michigan breweries featuring nearly 100 varieties of beer, mead, and hard cider, what better way could you celebrate City Park Grill’s storied past and National Beer Day? Advance tickets are available for $15 and include a Hopfest glass with six 3-ounce pours. Same-day tickets cost $20 and are available at the door. For more information on ticket purchases, call 231.347.0101. This five-course dinner featuring The Cooks’ House, Raduno, and Chef Pete Peterson is going to be amazing! Limited seats, $60 per person. Tickets available at MyNorthTickets.com. These monthly, wine-paired culinary experiences are inspired by the best local, seasonal ingredients sourced from Northern Michigan’s finest farms. Tickets ($75) are limited to 50 guests and the price includes tax and gratuity. View the menu here. Drink, laugh, and be astonished as the critically acclaimed magician and actor Ben Whiting performs world-class magic and mind reading right in front of your eyes. Tickets are $30 and include the show, hors d’oeuvres, and a glass of wine. Come be a part of the largest chocolate festival in Michigan. Because this is a popular event, there will be two different times: 11:30 a.m.–2 p.m. or 2:30–5 p.m. It is recommended that you purchase your tickets in advance. Any remaining tickets for each time will be available at the door. Explore the composers, repertoire and stories behind the music with Maestro Kevin Rhodes. Tickets cost $25 per person and includes lunch at the Traverse City Golf & Country Club. The event will feature different styles of oysters complemented by sparkling wines from Big Little, Mawby, Left Foot Charley, 2 Lads, and Bowers Harbor. Tickets ($35 per person) for this event includes six oysters and six tastes of sparkling wine (2-ounce pours each). Additional sparkling wine and oysters will be available for purchase. Forks to Funnies is a dinner theater at The Landing Restaurant, followed by the East Jordan Rotary Variety Show at the EJ High School Auditorium. The Landing will use inspiration from this years’ show to curate a delicious buffet menu. Performers will entertain, energize, and crack you up during your meal. Following dinner, you will have a reserved parking area, as well as reserved seats at the high school auditorium for the Variety Show. Learn to make sausage from scratch. This hands-on class will guide you through proper equipment use and technique to make homemade fresh sausages and will show you different ways to incorporate sausage into dishes. Quebec’s Le Vent du Nord knows how to turn the lost past into intense and beautiful performances that push their roots in striking global directions. The group is blazing a path that connects their Québecois roots to the wider world, in both arrangements and on stage. Considered a driving force in progressive folk, they infuse old Québec with a breath of fresh, cosmopolitan air. With ODYSSEY, their extraordinary Sony Masterworks debut album, The Accidentals affirm their place among contemporary music’s most original and adventurous new bands. Multi-instrumentalists Sav Buist and Katie Larson—joined on stage and in the studio by drummer Michael Dause—have crafted a genre all their own, fueled by their uniquely limitless approach to musicality and songcraft. Switchback is the award-winning duo of Brian FitzGerald and Martin McCormack, who draw on traditional music and original songs to reflect their Irish heritage and Midwestern roots. Playing a mix of mandolin, guitar, and bass, their harmonies have won them comparisons to famous duos such as the Everly Brothers and Simon and Garfunkel. The Wind Symphony is made up of talented community musicians of all ages, hard-working student musicians, and excited high school musicians aspiring to bring their musicianship to the next level. Blending voices and instruments into potent musical statements, the NMC and Interlochen Center for the Arts Choirs join the Traverse Symphony Orchestra to present a beautiful program. Find more things to do in Northern Michigan with MyNorth’s Event Calendar!